"Some folks up in tree tops just lookin' for their kites!". 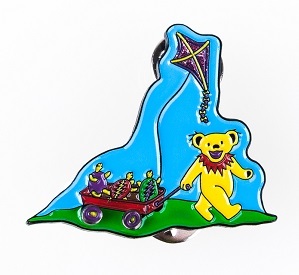 This pin features a dancing bear pulling a wagon (with wheels that spin!) full of his terrapin buddies flying a glittery kite. It's designed by Taylor Swope of Little Hippie Designs. It measures approximately 1 1/2", is made of hard enamel metal. It's also double posted, comes stamped with Taylor Swopes initials, the Kingpin Designs logo, and is individually numbered out of 250. Officially licensed Grateful Dead merchandise.